In my mind, I can draw a parallel between fishes and women. Like the fishes survive in the vast precarious deep blue oceans among the other big and small fishes, so do the women sustain themselves in this perilous and treacherous world. Through my work of art I want to project the character traits of the modern and fearless women. I choose to portray the larger than life qualities which every single woman possesses, however, usually she is unaware of these prolific qualities. My paintings represent women in a glorifying spotlight highlighting confidence, ascendancy, optimism and grandeur. 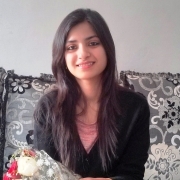 Alina Wahid holds a Masters degree of Fine Arts in Painting from Jamia Millia Islamia and Professional Diploma in Computer Applications and Programming from F.Tec Computer Education, a division of FS-HRD, New Delhi. Wahid has been a part of many group exhibitions. She has also displayed her talent by holding two solo exhibitions. Highly appreciated by art collectors, her painting adroitness has also been noticed internationally.